Visit our new "Express" location in Irvine! At The Olives Branch you will enjoy the freshest, most flavorful entrees made famous by our signature blend of imported/authentic Mediterranean spices. Our dishes have an abundance of flavor, not calories, an are fitting for anyone following a low calorie diet. Happy Hour at the Bar & Lounge. $3 Draft Beers and 1/2 OFF select glasses of wine. Enjoy our variety of fresh and tasty appetizers from our Happy Hour menu to satisfy your cravings. The Olives Branch Hookah Lounge has redefined exotic and tranquility. From the moment you walk in, the vibrant essence and visuals take over. As you are greeted and seated by our friendly staff you quickly realize that we are not just a Hookah Lounge. The Olives Branch is located in Southern Orange County, between Irvine and Dana Point in the beautiful city of San Juan Capistrano. 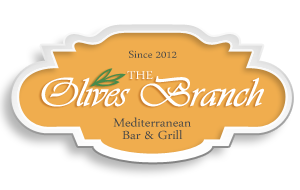 The Olives Branch is where fresh, healthy Mediterranean food is prepared daily. The word “fresh and healthy” isn’t thrown around lightly at The Olives Branch. Each of the many entrees, sandwiches, salads, dips, and sauces are all made from scratch with the freshest, high quality ingredients every day. Meats and Chicken are prepared daily and always grilled to order. We choose only the freshest, highest quality, choicest meats, poultry and vegetables to serve in our restaurant. What does this all mean? It means crisp vegetables and tender meats, all bursting with flavor in each and every bite. Until you’ve tried The Olives Branch, You’ve Never Tasted “Healthy” Like This. At The Olives Branch Mediterranean Grill, you’ll enjoy the freshest, most flavorful entrees made famous by our signature blend of imported/authentic Mediterranean spices. Our dishes have an abundance of flavor, not calories, and are fitting for anyone following a low calorie diet. The Olives Branch’s tasty and healthy Mediterranean food is prepared with our own family special recipes, has earned them several food critics’ praise. If you are planning a wedding, a corporate meeting, a dinner party or birthday party, you can count on The Olives Branch for an out of this world exotic catering service which is sure to impress your guests. Our prices can fit into anyone’s budget and our food will have your guests coming back for more!